€ 550.00 Registrations period has ended. € 475.00 Registrations period has ended. Early Bird General Admission Fee. Applies also to PhD Students (Must be able to present student ID). € 225.00 Registrations period has ended. General Admission Fee. Applies also to PhD Students (Must be able to present student ID). € 275.00 Registrations period has ended. Discount € 200.00 Registrations period has ended. 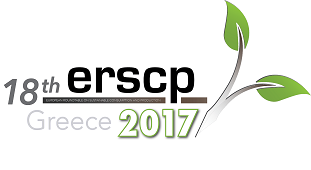 The ERSCP is one of Europe's most remarkable conferences in its field and has taken place periodically since 1994. ERSCPs favors discussions about the key issues in sustainable consumption and production; the exchange of thoughts, knowledge, experiences and SCP proposals; and the creation of a European (also worldwide) community of research and practice in sustainable consumption and production. The main goal of the ERSCPs is to encourage discussion amongst stakeholders involved in sustainable consumption and production: businesses, public institutions, universities, institutes and research centers, NGOs, SMEs, professional associations, decision-makers, etc. More than 400 stakeholders from businesses, cities and communities, public institutions, universities, institutes and research centers, NGOs, SMEs, professional associations, decision-makers, are expected to attend. As soon as you complete the payment, please forward at info@erscp2017.eu the proof of payment (either a bank deposit or e-banking order) in .pdf format. Upon reception and confirmation of the proof of payment, you will receive your e-ticket. To facilitate your entry on the day of the event please save it to your phone, or print it and bring it with you. Registration fees include Admittance to the Conference, Conference Bag, Conference E-Proceedings, Coffee Breaks, Welcome Cocktail Reception, two Lunches and the Gala Dinner with Traditional Local Cuisine. Attention: Members of NTUA who wish to charge the conference fees to specific project(s), please do not proceed with the payment rather than inform us of the project details (Full title/Acronym/Funding Tool/etc) so that the fees may be paid directly from NTUAs Special Account of Research Funds.